Today Amanda and Rachel tells us how they met The Wanted, Max George, Jay McGuiness, Siva Kaneswaran, Tom Parker, Nathan Sykes,. 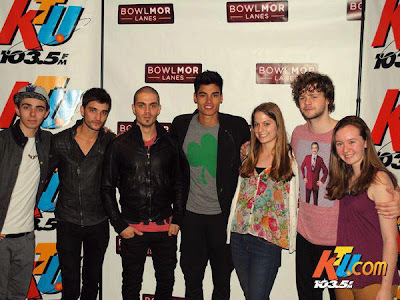 We won tickets to KTU's album release party for The Wanted in April. We got there about two hours early & met Cody Simpson while we were online! Then The Wanted came in and Jay waved to us. They performed a short concert and after there was a meet and greet where we were supposed to take pictures with them in front of a backdrop six girls at a time. Amanda was rushed so she went with girls she didn't know, but Rachel & our friend waited and got their own picture! The boys were so nice & kissed us on the cheek & gave us hugs. They all told us they hoped we enjoyed the show. As they were leaving they hugged us again, Jay kissed Rachel on the cheek again, and Siva took a picture with Amanda but it came out really blurry. When we were leaving we got a little lost and ended up passing the venue about 15 minutes after the show was over. Nathan came out and hopped in a cab by himself. We said hi to him and he was really sweet. They are our favorite band ever so it was an amazing day!"